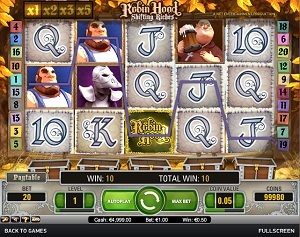 Robin Hood: Shifting Riches is an awesomely fun and amazing 3D online video slot machine game from Net Entertainment that has been released in September 2011. This online video slot game has 5 reels and 20 pay lines. The theme of Robin Hood: Shifting Riches is based on the classic and well-known children’s fairy tale story of the same name. Before you will play this online slot game, you would normally think that it would just be a slot game based on a children’s bedtime story and it would not interest you as much. However, once you play the game itself, you will surely change your mind! Robin Hood: Shifting Riches online slots, thanks to Net Entertainment’s inventive ideas and clever game designs, this game features a one-of-a-kind Shifting Reels feature that makes the traditional spinning reels to shift to the right once you hit a win on an active pay line! Combine this with an increasing multiplier of up to x5, the Shifting Reels function truly offers more winning opportunities and intense gameplay! Another exciting thing about this particular slot game is the Money Bag scatter symbol which is collected in a treasure chest by Robin Hood himself – obtain 4 Money Bags and you will trigger the Free Spin Bonus Feature game. To totally make the game more interesting, Net Entertainment has topped it with an extra Wild symbol that is randomly selected to help you get the chance to win more prizes! With all these features packed into one awesome video slot game, you will never think Robin Hood being that old classic children’s fairy tale ever again! As always, when it comes to any of their slots games, Net Entertainment allows interested slot players to play instantly without requiring them to download anything. If you have loved the story of Robin Hood when you were a child, then for sure you will definitely stick around and play its slot game version for a while, maybe even for a longer while! Help Robin Hood and his band of merry men rob from the rich and give to the poor in this action adventure-filled slots game which offers a maximum coin jackpot of 10,000, a maximum cash jackpot of $5,000, a unique Shifting Reels function, an increasing multiplier of up to x5 every time you get winning combinations, an awesome Money Bag scatter symbols that enable the Free Spin Bonus Feature game plus an additional Wild Feature for increased winning opportunities and a high prize win capacity (the Money Bag feature is also designed to save the collected bags for up to 1 year! ), and last but not least, a truly generous 96.8% payout ratio! What most online slot players find enticing about Net Entertainment is that they offer fun graphics and entertainingly happy sounds, which make online slots more fun and enjoyable to spend time with. Robin Hood: Shifting Riches online slots will truly take you back to the time when you were a little child reading/hearing wonderful and magical fairy tale stories, only this one is much more fun because you get to win excellent prizes at the same time! In the main game, the background setting of the reels is of a solid color, but just outside of the reels, you will see a setting of what seems like Sherwood Forest, the place where Robin Hood and his band of merry men reside. The symbols are stunningly created in 3D animation. This online slot game is designed for long hours of playing and it is guaranteed not to hurt your eyes. The overall graphic design of Robin Hood: Shifting Riches displays colors such as green, blue, red, purple, orange, silver, yellow, white, pink and brown. The constant background sound played while you are playing Robin Hood: Shifting Riches somewhat resembles music that you will hear in adventure-themed movies. Short, celebratory trumpet-like music is programmed when you hit winning combinations. The card deck symbols that are available in the Robin Hood: Shifting Riches slot game are 10, J, Q, K, and Ace. The regular symbols you will see also in this slot game are the Knight, Will Scarlet, Little John, Friar Tuck, and of course, Robin Hood himself. The Wild Symbol is the Robin Hood Logo symbol. The Robin Hood Logo acts as a substitute for all other symbols (except for the scatter symbol) in order to help you complete a winning combination. The Scatter Symbol is the Money Bag. The scatter symbol is not required to appear in a line on an active pay line for you to win. The Money Bag scatter symbol can be found scattered anywhere on the 5 reels. You will be able to activate the Free Spin Bonus Feature game when you manage to obtain 4 Money Bag scatter symbols in a single treasure chest. Money Bag scatter symbols, after the reels shift, will turn into Robin Hood Logo wild symbols. Please take note that the Money Bag scatter symbols will not give out any winnings to you, but instead they will let you enter the Free Spin Bonus Feature game. Robin Hood: Shifting Riches has an excellent Free Spins Bonus Feature game that is very unique as compared to the other online video slots games offered by Net Entertainment. Robin Hood: Shifting Riches Free Spins Bonus Feature Game – You must collect 4 Money Bags in a single treasure chest to activate the Free Spin Bonus Feature game wherein you will be awarded 10 Free Spins to play with. At the beginning of the Free Spin Bonus Feature game, you can have more than 1 complete treasure chest. Each additional treasure chest you have, you will be given 10 additional Free Spins! The Free Spin Bonus Feature game will start with one of the main characters (Robin Hood, Little John, Friar Tuck, Will Scarlet, and the Knight) being chosen as the Free Spins Extra Wild symbol. The Free Spins Extra Wild symbol acts as a substitute for all symbols except for the Free Spins symbols and the Robin Hood Logo symbol. The Free Spin symbols only appear on the 3rd, 4th and 5th reels. You will not win Money Bag symbols while playing the Free Spin Bonus Feature game. If you obtain 2+ Free Spin symbols, you will enable extra Free Spins! The extra Free Spins you get are included to your remaining number of Free Spins. You may win an infinite amount of extra Free Spins during the Free Spin Bonus Feature game! By the time the Free Spin Bonus Feature game is over, the number of coins you’ve won in the Free Spin games are then converted back to their equivalent number of coins in the regular Robin Hood: Shifting Riches slot game. Do take note that any collected Money Bag symbols which have not been used up during your gameplay are saved for future gameplay for up to a period of 1 year! When the Free Spin Bonus Feature game is done, you are then taken back to the main Robin Hood: Shifting Riches online slot game, and your Free Spin Bonus Feature game winnings are included to your overall balance. Shifting Reels Feature – Robin Hood: Shifting Riches has an awesome Shifting Reels Feature wherein the reels shift just after a bet line win, which gives you more chances for extra wins, with an increasing multiplier of up to 5x! The reels work by shifting one position to the right, making way for a whole new reel on the left, and this gives you the chance to obtain possible winning combinations! As long as there are new pay line wins, the reels will always continue to shift. The Shifting Reels feature can also be activated during the Free Spin Bonus Feature games. Please take note that the multipliers are rewarded for each win on a shift: Reel Shift 1 equals to 2x multiplier; Reel Shift 2 equals to 3x multiplier; and Reel Shift 3+ equals to 5x multiplier. Robin Hood: Shifting Riches has 5 reels where you may bet on as many as 20 pay lines. The minimum bet is 0.01 and the maximum bet is 0.50 per line. You can wager from 1 up to 10 coins per bet line. Playing online video slot machine games is totally much more fun and exciting when it has an Autoplay function. You can play Robin Hood: Shifting Riches automatically by simply clicking on the Autoplay button located on the lower left side of the game screen, or you can click on the Autoplay button located just beside the Spin button (left side as well). You can set the number of spins by clicking on any numbered button, from 10 to 1000, and after selecting the number you want, click Start and the game will automatically spin for you. If you want a slightly more complex Autoplay setup, you can click on the Advanced Settings button and Stop Autoplay: on any win, if Free Spins is won, if a single win exceeds a certain amount, or if your cash increases/decreases by a certain amount you have specified. When you are done with your preferred Advanced Settings, just click on the Start button and the game will automatically play for you!